As a one-of-a-kind booster of downtown Salt Lake City, the late real-estate executive Vasilios Priskos should not just get awards posthumously, supporters said. He should have awards named after him. Priskos died last October at age 53 after a long fight with cancer — leaving a big gap in Utah’s commercial real estate community and especially the dynamic world of downtown development. Now, as the city marks its first Downtown Week, the affable and well-known businessman, mentor, family man, entrepreneur, urban landowner, developer and founder of real estate firm InterNet Properties has been memorialized with a series of honors. One of the Salt Lake Chamber’s top downtown accolades will forever bear his name. The mayor has dubbed a new midblock pedestrian walkway after Priskos. And later this week, graffiti artists will paint an unofficial tribute to him on Exchange Plaza. The son of Greek immigrants came to the United States in 1966 at age 2, born to Chris and Tula Prazikos Priskos in the village of Kamaritsa on the Greek island of Evia. Priskos worked in his family’s restaurant, The Royal Eatery, on downtown Main Street, before earning a University of Utah finance degree, going into real estate and eventually becoming a quiet downtown force. (Steve Griffin | Tribune file photo) Vasilios Priskos, seen in the lobby of one of his downtown Salt Lake City buildings in 1999. The late real-estate executive, who died last October aged 53, is being honored as part of Downtown Week. By his own account, working at the restaurant was how Priskos first fell in love with Salt Lake City’s urban core. Instead, the Downtown Alliance, representing merchants and property owners in the central business district, is permanently renaming its annual board chair’s award after Priskos. “He touched the lives of people from all walks of life, from bank presidents to elected officials to mom-and-pop Realtors to graffiti artists,” the alliance’s board president Molly Mazzolini said Wednesday. A grieving tenant of one of Priskos’ many commercial properties wrote to the chamber shortly after his death. On Monday, Salt Lake City Mayor Jackie Biskupski led a dedication of Vasilios Priskos Walkway, a midblock pedestrian route off downtown Main Street that was part of the city’s overhaul and beautification of Regent Street, just east of George S. and Dolores Doré Eccles Theater. The honor, Biskupski said, resonated with Priskos’ steady advocacy for revitalizing downtown. She and others noted his involvement in buying and renovating a host of downtown parcels, including the historic Ezra Thompson building. While converting that Main Street property into a for-profit institute now known as Neumont College of Computer Science, Priskos sold the city an adjacent property that made the Regent Street project possible. (Steve Griffin | Tribune file photo) A stretch of the improved Regent Street in Salt Lake City. Mayor Jackie Biskupski has renamed a nearby pedestrian walkway in honor of the late Vasilios Priskos, an influential real estate broker and champion of downtown. On Wednesday, downtown merchants honored Priskos in ceremonies at Rose Wagner Performing Arts Center. 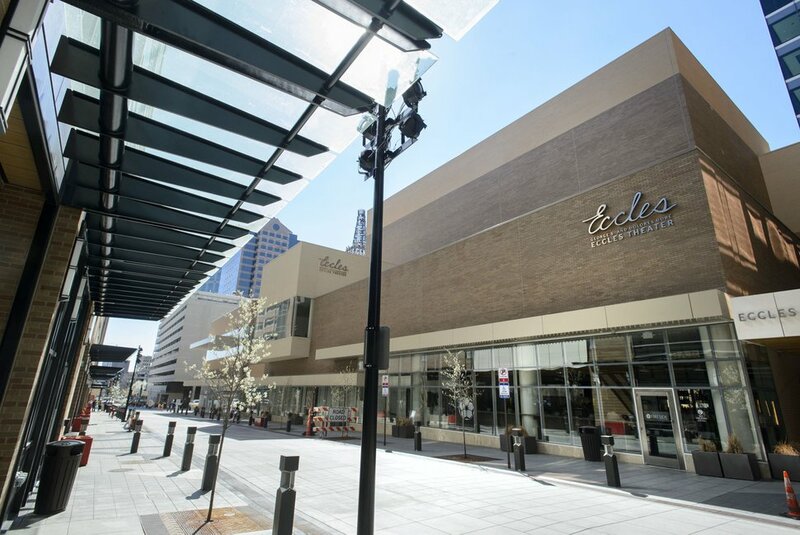 Others receiving achievement awards were Vestar, owner of The Gateway Mall; The Salt Lake Tribune, Utah’s largest daily newspaper; and officials behind joint city and county efforts to create an arts and cultural core downtown. However, he noted his father hated recognition. “So it’s kind of bittersweet,” he said. “At the same time, deep down inside he really would have loved this and would have appreciated everything everyone has done for him.